Raymond of Sabunde: From scripture to Reason. 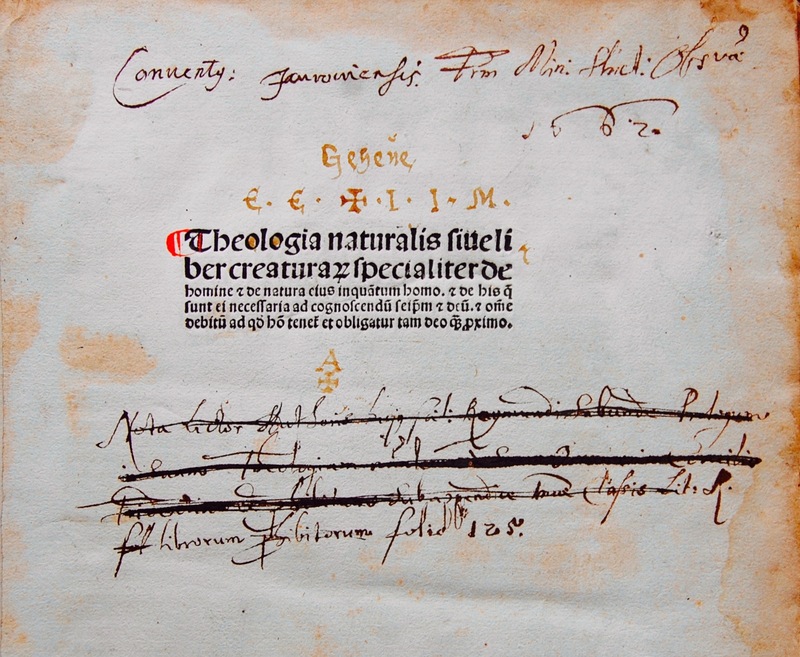 Theologia naturalis sive Liber creatura[rum] specialiter de homine [et] de natura eius in qua[n]tum homo. :[et] de his qu[a] sunt ei necessaria ad cognoscendu[m] seip[su]m [et] Deu[m] [et] om[n]e debitu[m] ad q[uo]d ho[mo] tenet[ur] et obligatur tam Deo q[uam] p[ro]ximo. Folio, 11X 8 inches . This is about the fifth printed edition. 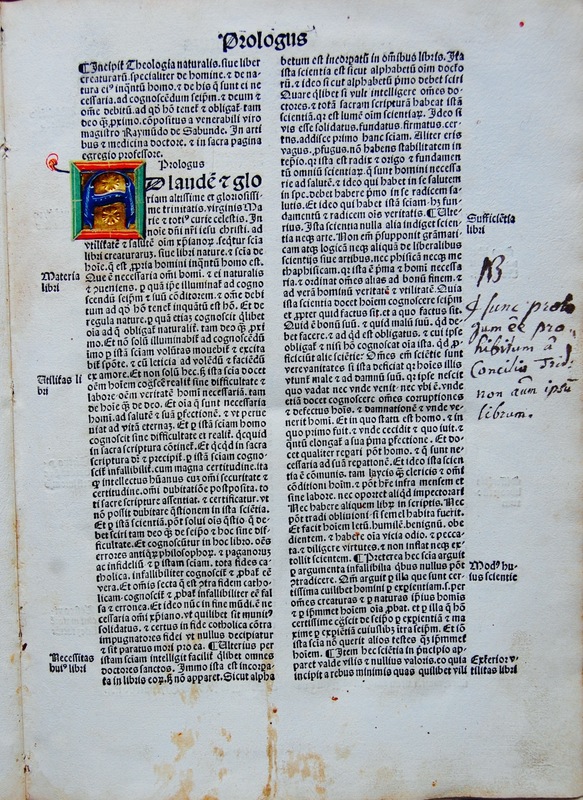 A-Q8 R6 In this copy there are contemporary manuscript initials added in red and blue, There is a gilt initial at the beginning of the prologue tooled in the gold leaf into a gesso ground. 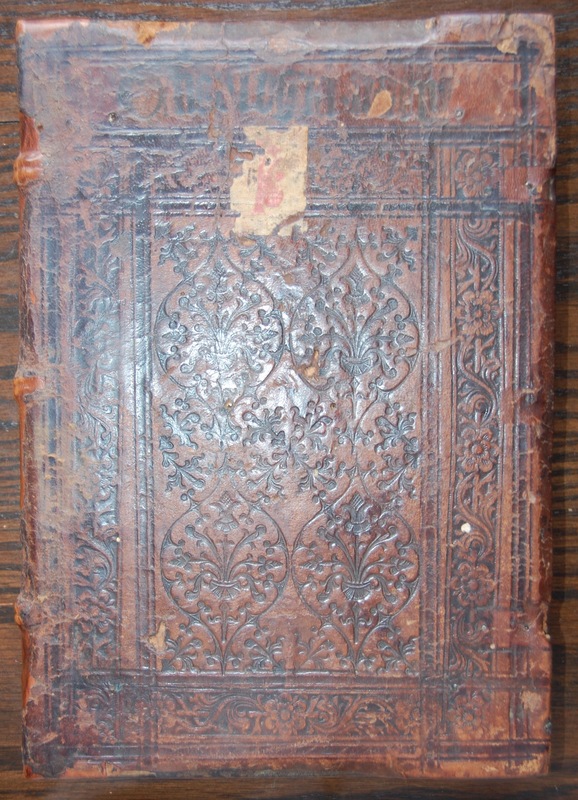 It is bound in full contemporary Nuremberg blind-tooled brown sheepskin over wooden boards,lacking clasps, titled is blind stamped on front board with contemporary paper label; There are several inscriptions on title, including reference to the Prologue’s inclusion on the Index Prohibitorum;(1589)there are the usual stains, browning and internal wear, some marginal rodent damage, the binding has been rebacked,it is a good solid copy . Sabunde was Born at Barcelona, Spain, towards the end of the fourteenth century; died 1432. From 1430 to his death he taught theology, philosophy, and medicine at the University of Toulouse. Apparently, he wrote several works on theology and philosophy, only one of which remains, “Theologia Naturalis”. It was first written in Spanish then translated into Latin. This text marks the dawn of a knowledge based on both Scripture and Reason. What is new and epoch-making is not the material but the method; not of circumscribing religion within the limits of reason, but, by logical collation, of elevating the same upon the basis of natural truth to a science accessible and convincing to all. He recognizes two sources of knowledge, the book of nature and the Bible. The first is universal and direct, the other serves partly to instruct man the better to understand nature, and partly to reveal new truths, not accessible to the natural understanding, but once revealed by God made apprehensible by natural reason. The book of nature, the contents of which are manifested through sense experience and self-consciousness, can no more be falsified than the Bible and may serve as an exhaustive source of knowledge; but through the fall of man it was rendered obscure, so that it became incapable of guiding to the real wisdom of salvation. However, the Bible as well as illumination from above, not in conflict with nature, enables one to reach the correct explanation and application of natural things and self. Hence, his book of nature as a human supplement to the divine Word is to be the basic knowledge of man, because it subtends the doctrines of Scripture with the immovable foundations of self-knowledge, and therefore plants the revealed truths upon the rational ground of universal human perception, internal and external. The first part presents analytically the facts of nature in ascending scale to man,the climax; the second, the harmonization of these with Christian doctrine and their fulfillment in the same. Nature in its. four stages of mere being, mere life, sensible consciousness, and self-consciousness, is crowned by man, who is not only the microcosm but the image of God. Nature points toward a supernatural creator possessing in himself in perfection all properties of the things created out of nothing (the cornerstone of natural theology ever after). Foremost is the ontological argument of Ansehn, followed by the physico-theological, psychological, and moral. He demonstrates the Trinity by analogy from rational grounds, and finally ascribes to man in view of his conscious elevation over things a spontaneous gratitude to God. Love is transformed into the object of its affection; and love to God brings man, and with him the universe estranged by sin, into harmony and unity with him. In this he betrays his mystical antecedents. Proceeding in the second part from this general postulation to its results for positive Christianity, he finds justified by reason all the historic facts of revealed religion, such as the person and works of Christ, as well as the infallibility of the Church and the Scriptures; and the necessity by rational proof of all the sacraments and practices of the Church and of the pope. It should be added that Raimund’s analysis of nature and self-knowledge is not thoroughgoing and his application is far from consistent. He does not transplant himself to the standpoint of the unbeliever, but rather executes an apology on the part of a consciousness already Christian, thus assuming conclusions in advance that should grow only out of his premises. Yet his is a long step from the barren speculation of scholasticism, and marks the dawn of a knowledge based on Scripture and reason. Montaigne (Essays, bk. ii. ch. xii., “An Apologie of Raymond Sebond”) tells how he translated the book into French and found “the conceits of the author to be excellent, the contexture of his work well followed, and his project full of pietie.. .. His drift is bold, and his scope adventurous, for he undertaketh by humane and naturall reasons, to establish and verifie all the articles of Christian religion against Atheists.” See D. Beulet, Un Inconnu celebre: recherches historiques et critiques sur Raymond de Sabunde (Paris, 1875).